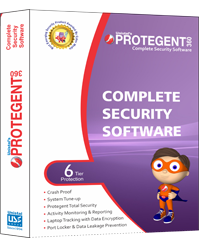 Protegent 360 Complete Security goes with the name and is an advanced complete software package with extremely advanced security features for comprehensive protection against advanced online cyber threats. Protegent 360 is designed with the prime motive of protection of data from viruses, data theft and attempts of unauthorized access to confidential data. Protegent Complete Security is capable of protecting your business, essential data and computer/laptop from malicious attacks. Packed with extremely unique and advanced features, it provides 75% extra features as compared other products available globally. Protegent Total Security goes beyond malware protection and with its extremely advanced features offers security against viruses, malware, root kits, Trojans, and other advanced online threats. It offers secure web browsing for you and your family. Protegent Total Security is termed to have 30% extra protection from other internet security products with the help of especially designed VB certified virus scan engine. Entertainment mode configures a silent mode across all modules of Protegent so that no prompt interrupts you while playing a game or watching a movie. Protect specific files and folders on your systemso that they are not deleted or modified by anyone. Protegent’s Password Manager prevent your passwords from getting stolen by cyber criminals.